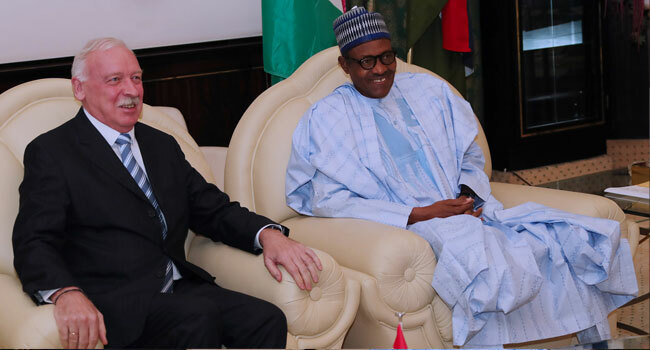 President Muhammadu Buhari with the outgoing Ambassador of the Kingdom of Denmark, Mr Torben Gettermann, at the State House in Abuja on August 27, 2018. President Muhammadu Buhari believes the establishment of dairy farms will go a long way in curbing clashes between cattle herders and farmers in the country. He said this when he received the outgoing Ambassador of the Kingdom of Denmark, Mr Torben Gettermann, at the Presidential Villa in Abuja, the nation’s capital. He also commended the Kaduna State government and the Kingdom of Denmark for championing an initiative on dairy farming. On his part, the Danish envoy, who spent four years in Nigeria, explained the concept of dairy farming further. He said the plan was to have 1,000 families of herdsmen with 12,000 heads of cattle in a location, where they would have veterinary attention, schools for their children, and generally live as a small community. Ambassador Gettermann added that a company from his country, Arla, was already available to buy the milk from the cattle farmers. He stressed that the Danish government would bring investors through its Agriculture Counsellor in the country, while the Kaduna State government would provide initial infrastructure and funding. The Danish envoy said, “Dairy farming is not exactly the same thing as ranching. It will yield better meat, and the Danish company will buy the milk from the farmers. “A pilot project will start in Kaduna, and then move to other locations, as it becomes commercially viable,” he added. Mr Gettermann is proceeding on retirement after 40 years in the service of his country. The Presidency disclosed the meeting in a statement by the Special Adviser to the President on Media and Publicity, Mr Femi Adesina.